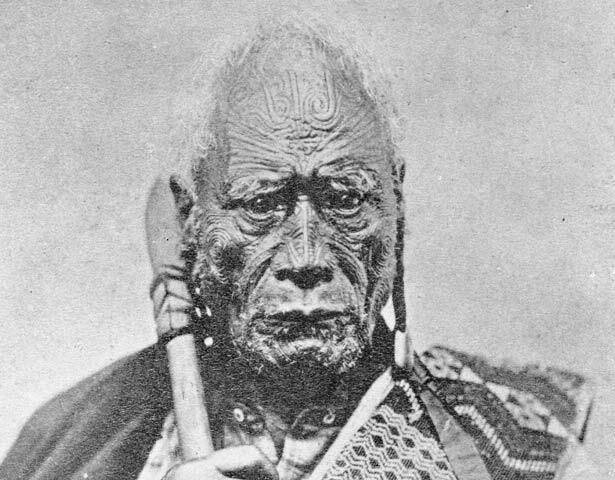 Tāraia Ngākuti Te Tumuhuia (?–1872) belonged to the Hauraki tribes Ngāti Tamaterā and Ngāti Maru. Much of his life was taken up with warfare, and he remained a chief of the "old school" - rejecting the intrusion of Europeans in the traditional Māori world. When Thomas Bunbury brought the Treaty of Waitangi to Hauraki, Taraia refused to sign. From then on he claimed the right to resolve disputes in the time-honoured way, by force if necessary. In 1842 he attacked Ngāi Te Rangi, a Tauranga tribe who had long been enemies of Ngāti Tamaterā. Several Ngai Te Rāngi were killed or captured, and some were eaten. When challenged by Crown officials he insisted that as he had not signed the Treaty, his affairs were no business of the governor, especially as no Europeans were involved. Later, however, he accepted a Crown settlement of the dispute, returning prisoners and compensating the aggrieved Tauranga Māori. Because of this and other such incidents colonial officials debated whether it was lawful to use force against Māori who had not signed the Treaty. Opinion was divided. Ultimately, the Colonial Office in London concluded that all Māori were British subjects, whether or not they had signed the Treaty. However, the colony had so few police and troops that it would be difficult to enforce British law. It was therefore decided that the Crown would rule by "moral suasion", and take a liberal attitude towards Māori inter-tribal matters. In 1850 Tāraia became the leading chief of Ngāti Maru and Ngāti Tamaterā. In later life he successfully resisted pressure to open Hauraki lands to gold mining, but eventually lost the cause. In the 1860s Tāraia was in favour of the King Movement, but by this time he was too old and frail to go to war himself. However, a contingent of Ngāti Maru fought in the Waikato campaign, and Tāraia sent a cask of gunpowder to King Tāwhiao. He died at Thames in 1872; he was said to have been over 80. Nō Ngāti Tamaterā me Ngāti Maru a Tāraia Ngākuti Te Tumuhuia (?-1872). Ko Tūmatauenga te atua ārahi i a Taraia i ōna rā, mate rawa. He rangatira ia nō te “ao kōhatu”, hei aha māna te Pākehā me tōna ao. I te kawenga a Thomas Bunbury i te Tiriti o Waitangi ki Hauraki, kāore a Taraia i haina. Mai i taua wā, ki te pā he raruraru ki a ia, māna tonu e whakatikatika i runga anō i ngā tikanga o tua whakarere. I te tau 1842 ka whakaekengia e Tāraia a Ngāi Te Rangi, iwi o Tauranga. Kua roa e mauāhara ana ēnei iwi, a Ngāi Te Rangi me Ngāti Tamaterā, tētahi ki tētahi. Ka whakamatea, ka mauherea ētahi o Ngāi Te Rangi, kainga ana ētahi. I te weronga mai a ngā āpiha a te Karauna mō tēnei mahi, ko te whakautu a Tāraia pēnei; kāore ia i haina te Tiriti o Waitangi, nā reira ko wai te kāwana ki te aruaru he aha āna nekeneke, me te mea anō, kāore i whara he Pākehā i tēnei mahi. Heoi, nō muri mai ka whakaae ia ki te whakataunga a te Karauna i te raruraru. Ka tukua ngā mauhere, ka whakawhiwhia tētahi paremata ki ngā Māori o Tauranga. Nā tēnei raruraru me ētahi atu i taua wā, ka wānanga ngā āpiha o te kāwanatanga mēnā ka āhei i raro i te ture te pakanga ki ngā Māori kāore i haina i te Tiriti. He whakaaro tō tēnā āpiha, he whakaaro tō tēnā āpiha. I te mutunga, ka whakatau te Tari mō ngā Koroni kei raro ngā Māori katoa i te maru o Peretānia, tae rawa atu ki te hunga kāore i haina i te Tiriti. Heoi, nā te tokoiti o ana pirihimana, ana hōia, me uaua ka whakapūmautia te ture Peretānia. Nā reira, ka pā ana te raruraru, ka huri kē te Karauna ki te kōrero mō te tika, mō te hē hei tāmi i ngā mahi kino; ki te tipu he tautohenga ā-iwi, kāore te Karauna mō te kuhu kau noa. Tatū ki te tau 1850 ko Tāraia te rangatira nui o Ngāti Tamaterā, o Ngāti Maru. Ahakoa tana ngana ki te aukati i te keri koura ki te rohe o Hauraki, hauwarea. I te tekau tau atu i 1860, ka tautoko a Tāraia i te Kīngitanga, ahakoa te mea kua koroua rawa ia ki te whawhai. I roto tētahi taua o Ngāti Maru i ngā riri ki te riu ki Waikato, nā Tāraia hoki tētahi kāho paura i tuku ki a Kīngi Tāwhiao. Ka mate ia ki Pārāwai i te tau 1872. E ai ki te kōrero, neke atu i te 80 tana pakeke. We have 40 biographies, 12 articles, related to Tāraia Ngākuti Te Tumuhuia.